BoulderRush - boulderdash type game where you collect a required amount of diamonds before moving on to the next level. This is not as easy as it sounds because besides a time limit you have to move through boulders keeping them from falling on you and deal with enemies by dropping boulders on them. 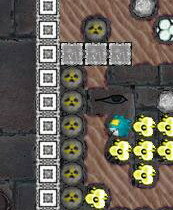 The enemies are Fireflies, Butterflies, Lava, Slime, Expanding wall, and Stone Butterflies. Some destroyed enemies turn into diamonds most of which are needed to meet your requirement to move on to the next level. There are also helpful items which includes Magic walls, Dummy, Bombs, and Skulls. There is also a recorder for recording and replaying your moves. You can also jump to any cave you want without having to complete the previous ones first.